The spins, the twirls … a tire swing is basically a miniature merry-go-round in the sky, and it’s not for the faint of heart. Give your special needs kids the toughest heavy duty tire swing set around, with our tripod design. With 3 vertical posts at either end of the horizontal pipe, the structure stays still, no matter how high-flying the acrobatics get. The “modern”-design yokes (which appear in red in the photo above) add even more stability. 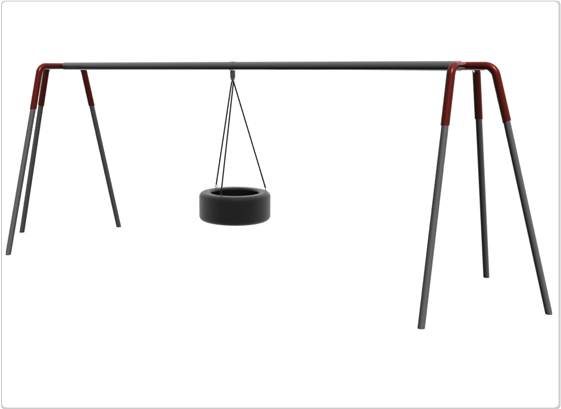 This heavy duty design can handle several kids at the same time, and ages 2 to 12 years can launch themselves spinning without making the structure move an inch. Comes with tire swivel hanger, tire, and galvanized steel chain. We also offer upgrade packages of tougher swing hangers and plastic-coated chains (please phone us for more information).